8 months after triumphing over Serizawa Tamao (Takayuki Yamada), Takiya Genji (Shun Oguri) still struggles to attain supremacy at Suzuran All-Boys High School. Following a decisive defeat at the hands of the legendary Rindaman, and on the verge of graduating without fulfilling his goal, Genji grows quietly desperate. He begins challenging Rindaman regularly, but consistently fails to beat him. His situation escalates when he unwittingly breaks a non-aggression pact between Suzuran and a rival school, Housen Academy, by coming to the aid of Kawanishi Noboru (Shinnosuke Abe) during a heated confrontation. Genji learns that the agreement between the two schools was established two years prior when, during a skirmish, Noboru violated a gang law and used a weapon to fatally wound Housen's former leader, Bitō Makio. Suzuran had subsequently sworn not to interfere with Housen's retribution upon Noboru's release from prison. 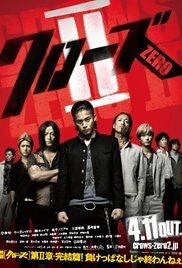 Genji's protection of Kawanishi provokes Housen's current leader, Narumi Taiga (Nobuaki Kaneko), to declare war against Suzuran. Genji and his allies go on the defensive, engaging in several violent conflicts with Housen's "Army of Killers". Read more on Wikipedia.